April....what shopping damage have I done?! Hands up...I've confessed to a few purchases throughout the month but there are a couple that I haven't really shared yet! Here's the first item I bought in April, a useful little black jacket from Mango. I see this pulling lots of outfits together, it's just a classic! If you follow me on Instagram you may have noticed that I had a little H&M haul delivered at the beginning of the week.....it cheered me up no end on Monday whilst in the throes of my housework! I have to put my hands up here and say that out of this little lot I only kept the sandals! 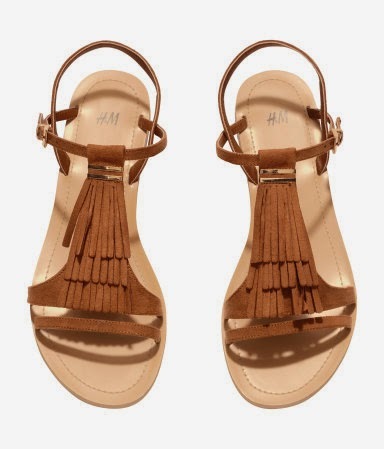 They are a fab, bargain little nod to the boho trend this season! Whilst we are on the subject of tan sandals....I also bought these London Rebel ones thanks to Eve All Worn Out. Sadly they are now sold out. Following through on the 70's/boho vibe again, I bought this lovely little shell top from New Look which I can't find on their website but does happen to be on the ASOS. 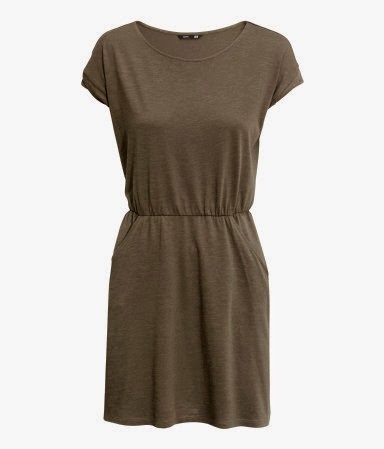 Whilst doing my H&M returns I managed to pick up a bit more khaki, in the way of a dress this time! A good, basic go-to dress in my favourite colour at the mo! 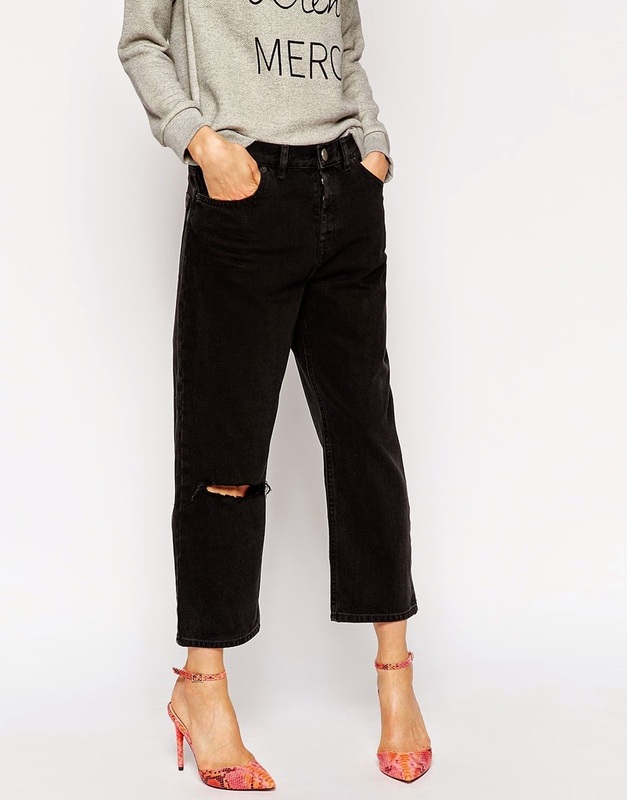 Last but not least, I have bought these ASOS Maddox cropped jeans....the jury is still out as to whether or not they are keepers! I'm at that point in the season that I've made all of the essential purchases and I am now just looking for trouble....I bet this resonates with a lot of you lovely ladies!! Tell me what you think, I have a feeling they will be a bit of a marmite item?! This post has in part been inspired by a lovely blog I've come across called Un-Fancy that's all about working a capsule wardrobe. Sadly the lady who writes it (Caroline) is now taking a sabbatical as she is off on an adventure but she has got me thinking about simplifying things and how that has an effect on your life in general so I am enjoying reading her posts from the beginning. Maybe this is the beginning of a new chapter for me? It's certainly making me look at things differently as my wardrobe feels pretty saturated right now! I feel the stirrings of a change of sorts coming along and this could be just what I need, it sounds really refreshing to uncomplicate things! Here's the round-up of this weeks outfits! First outing for my new Mango jacket. So have you had a good or bad month purchase-wise? which turned out to be a really bad idea! There is nothing like finding an item is out of stock to spur you on is there?! So that's 3 pairs of khaki trews added to the wardrobe in the space of a month! Oh and then I went and unearthed these that have been languishing in the closet for a couple of years! Yep, I think we can safely say I have fulfilled my khaki quota and as one of my lovely friends, Sian ;0) has pointed out, I may be in need of KA.....khaki anonymous!! Quick note....I've found the army style trousers are cut on the generous side so I would recommend that you size down with these if you are thinking of ordering! I am wearing a size UK 8 which are still very roomy. So a quick recap of what I've been wearing this past week! Here are is the evidence of my latest fixation both pairs of trews were worn straight away! Taking some inspiration yet again from another one of those French Voguettes! This time it's the turn of Capucine Safyurtlu. Now we are finally talking.....weather wise!! We are actually having a proper whiff of Spring and some sunshine. 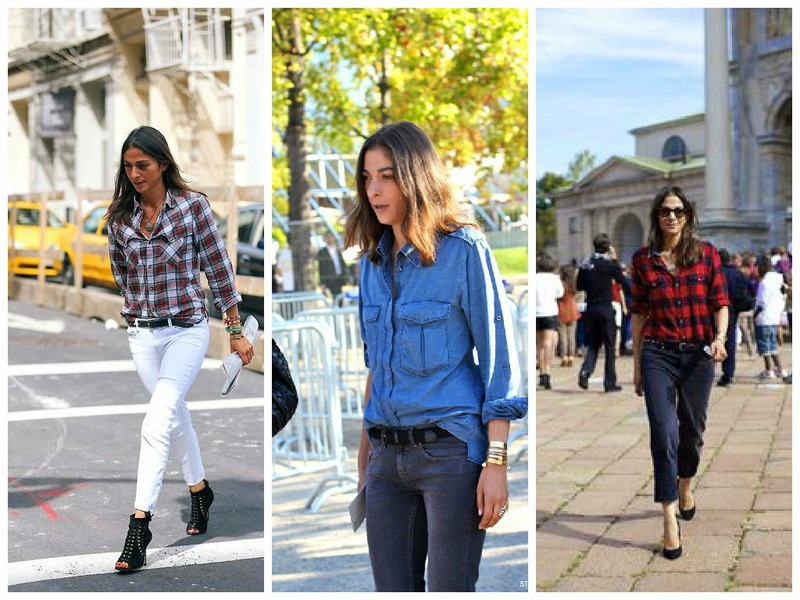 The perfect transitional item to whip out of the wardrobe for me is the shirt! At least half of my outfits over the past week have featured my new fashion favourite, so with the help of my new style heroine, I'll start sharing the shirt love with some khaki action from Capucine. I've had my Primark utility shirt for a while now and have been itching to wear so I didn't waste the opportunity to steal this look as the sun has been shining today! Worn here with some off-white Primark skinnies that are a couple of seasons old and some ancient Zara leopard print flats. I should have been a bit smarter and donned a grey tee under the shirt as Capucine has done above as it was a bit nippy by the sea! Another look that I have been coveting is this one. Love the crisp blue shirt with the white skinnies! My version here with Topshop shirt, Jamie white skinnies and made slightly more half term friendly with my Vans in place of Capucine's fabulous heels! Here's another little trio of looks that will be tried and tested forthwith! Now this next shirt ensemble was inspired by a blogger much closer to home, the lovely Karen @Mission;Style, stolen from one of her amazing looks that can be found on her Instagram feed. My jacket is Superdry via T K Maxx some time ago, the shirt is Uniqlo past season, worn with Topshop Jamie's and the Van's again. My Topshop white shirt has featured a couple of times over the past week. The first airing I wore it with Topshop jacket, Zara jeans, Vans and Jigsaw bag via eBay. Second time around, Topshop shirt again with some ancient Topshop linen cargo trews and more Van's! Trying out that Parisienne favourite the *tuck* here! Then there are the beginning of half term outfits when the weather was decidedly chillier! Are you a fan of the shirt or do you have another transitional piece that tickles your fancy?! I promised to reveal what I've been stashing for my holiday....hope to bring that to you next time!